Entry filed under: Gifts For Quilters. Tags: Ami Simms, M.A.S.H., Quilting, quilting tags. Great review Ami. It is so nice to have our own product tester. I have been looking at the Coneflower ad’s in the magazines and wondered if they were worth the investment. Now we know! Thanks so much. Oh, and PS, they would make a great gift for a sewing buddy. I just toss my my thread in a tall narrow coffee cup that I got as a freebie somewhere. When I tried to reheat my coffee in the microwave, the cup sparked so I decided that it’s probably not that safe to drink from if it sparks in the microwave. It may have been the paint on the cup but I’m not taking chances. Anyway…I set the cup on a pile of junk about 2 feet from my machine and go to town. The thread does get to jumping but so far hasn’t managed to escape the cup – yet. I would love one of the coneflower thread things, but my budget is non-existent for non-essentials. Gotta love the Michigan economy. What actually makes it up-and-down vs side-to-side?? My quilts hold together but maybe they’d be better if I understood this after 20+ years of quilting in the dark so to speak. Look at the pattern of the thread on the spool. The criss-crossing of the thread makes that type feed better horizontally. I went to Paul’s website, those Coneflowers are so cool. A piece of artwork and it is functional too. Can’t afford one right now but did bookmark the site, I could see it as a birthday or Christmas gift (could somebody notify my kids plese?). Checked out your bowl tuteriol too, very well done! Dear Ammi, THANK YOU! I am a new quilter and am looking for sites that are instructional. I am also new to sewing, so good basic information is greatly appreciated…not to mention a little humor just makes learning more fun. Please keep the tips coming. “Poke your eye out!” Ha, ha, ha!!! I haven’t heard that in years! My mom used to tell all us kids that — we all survived with our eyes intact, but I still smile when I hear that expression, it reminds me of her! Thanks for the info and the review of the Coneflower. I’ve noticed it especially in the Connecting Threads print catalog. Now I’m putting one on my Christmas wish list. Incidentally, my Vikiing D-1 has both types of spool holders, the lateral and the vertical, but I never knew exactly why there was a choice until this blog. I had noted the difference in the way spools are spun with thread but didn’t know how it affected tension. Now it all makes sense. Thanks for continuing to teach us these little known essential facts. i gave me mine for my birthday this year. i LOVE it. i remember that MASH episode. and i remember the old fashioned wagenstein suctions!!!!!!!!!!! showing my nursing age. 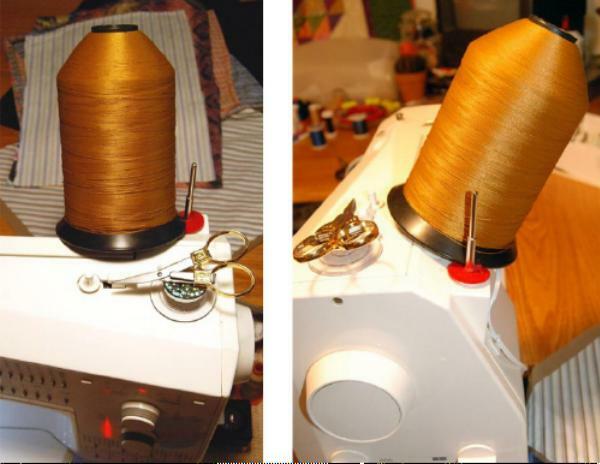 My Janome Gem only has a sideways spindle with a small stopper and a larger stopper for different size spools. If there is a way to have an upright spindle, I don’t know about it. So, the up and down spools have to be used sideways on that machine. I do sometimes have trouble with the thread wrapping around the spindle. You explain things so nicely, Ami. Last Mother’s Day I emailed my 50-y-o son at work and gave him Paul’s Metal Petals site and said that the”Sara” Coneflower double petal is what I wanted for Mother’s Day and could he make it happen? He emailed back, “Mother, you make this so easy for me, it is done”. I was thrilled and I absolutley love that thread stand. For my birthday I requested a Gingher Rotary Cutter, something I would not buy myself, and he looked for it on his own and even bought three extra blades. Gotta love a son like that. Now if his wife had shopped I would have ended up with a “themed basket” of stuff . I don’t want much, I just want what I want and not what they think I should want. Happy Judy C in NC. I use a banana hanger to thread my big spools. It was one of those tips about double uses.. works slick. I have seen the flower thing, I guess it is cuter than a banana hanger.. The coneflower thread lifters are very artistic and it’s wonderful too to have them be useful along with that. I’ll give him a nod on facebook. You are so creative, Ami—-I bow to you or should I curtsy?! I have the double flower flower holder that I got for my last birthday and I love it!!! A rose among the thorns!!!! These are marvelous, aren’t they. I found them a while back, but lucky me, I actually have an OLD Singer Touch n Sew, model 756, which actually has BOTH types of spool holders. The optional up and down one, and the permanently affixed laying down on its’ side one (which of course is my fave). Thanks for sharing Ami and go buy some fabric! I’ve had a basic cone thread holder for years. 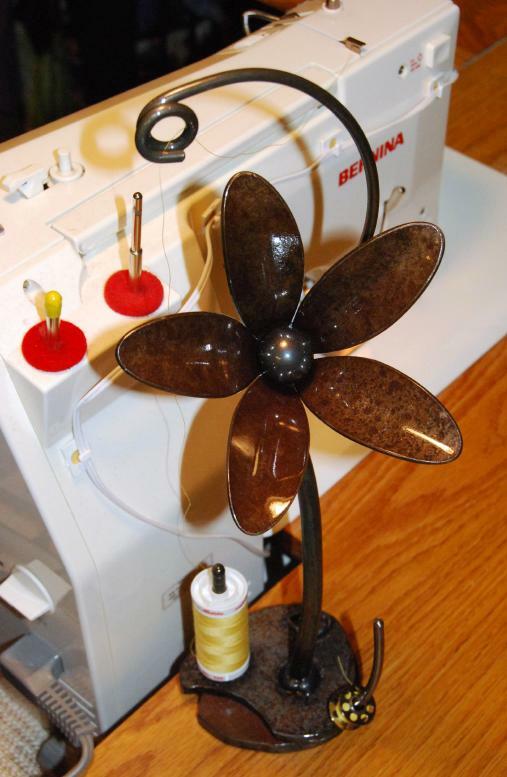 It has a circular heavy bottom, a 3-4″ spindle in the center to keep the cone of thread from wandering, and a long upright spindle with a loop at the top to pass the thread through on its way to my sewing machine thread track. Works great! I’ve seen a few recently that are made of plastic, and heard that they bounce all over the place when sewing fast. Maybe I’ll tie a silk flower to the top of mine to dress it up a bit. 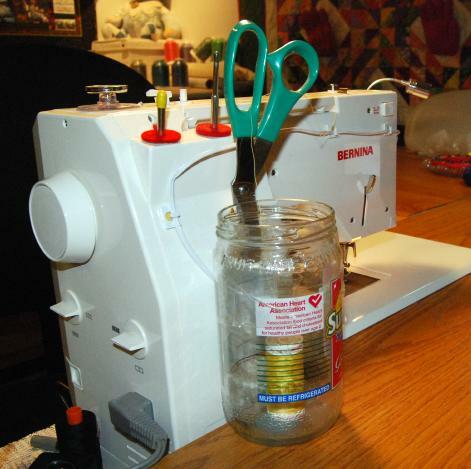 A friend from England had a very expensive and clever thread cone holder: she cut the bottom off a 2 litre soft drink bottle, put it over the cone, and threaded the thread through the neck of the bottle. Then she threaded her machine the usual way and off she went. I have one of the cone flower thread holders. I’ve never used it with the sewing machine but I just think that its beautiful in my dining room. He also has other things like paper towel holder, wine racks, etc. He shipped very fast and gave great service. A group of us from our guild bought ours in bulk.